Sam had recently joined a professional organisation as a director to help bring about change and introduce best practice. Having been in her role for 6 months, Sam was finding the tensions between change and growth in the organisation versus it wanting to stay the same, frustrating! Sam was noticing how very different her outlook was to others and came to coaching wanting to explore these tensions, and how she could manage them to achieve her objectives. We contracted for four 1.5 hour art based sessions which took place over a 5 month period. The first two sessions were key for Sam in unlocking those areas that were to help her achieve her objectives. The later sessions built on these two. In the first session Sam explored the organisation and her role within it. Sam created her first image and then reflecting on it explained it as ‘…a depiction of the tension between growth and constraint, between innovation and reservation, that seemed to be the unifying theme across the issues I had been contemplating earlier, although I hadn’t recognised it as such at that point.’ I then asked Sam where she was in the organisation. Sam realised that it didn’t have her in it. In Sam’s own words ‘…I couldn’t answer. I didn’t feel as though I was there, which prompted a mini emotional reaction that I couldn’t possibly have anticipated… After a time, I knew exactly how to represent me…’ When Sam included herself, it led to Sam identifying her feelings of difference and what Sam refers to as her ‘otherness’. 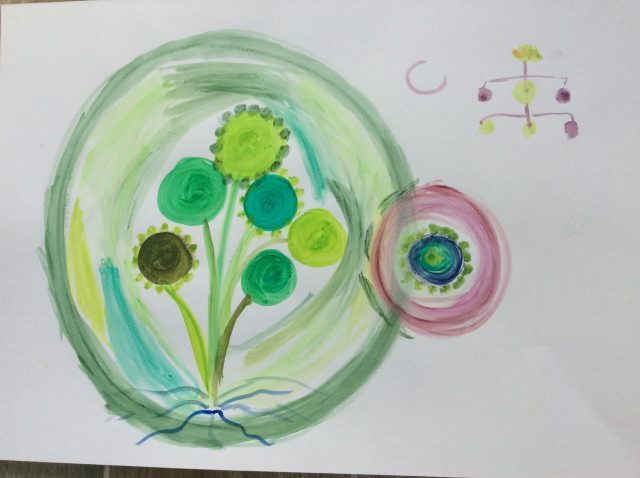 In this image Sam has shown her difference by putting herself as the purple circle pushing itself into the organisation’s green circle. This is a recurring theme for Sam throughout her career and became the focus for our second session together. The next post will look a Sam’s second session – exploring her feelings of ‘otherness’. (This case study is taken from one that will be in my book about art based coaching coming out Jan 2019 and I would like to say thank you to my client who has given me permission to share her case study. All names and some of the context has been changed to ensure my client’s confidentiality and privacy. ).